Andy Murray's father-in-law Nigel Sears is expected to be released from hospital on Sunday and has been given the all-clear to fly home to the UK. 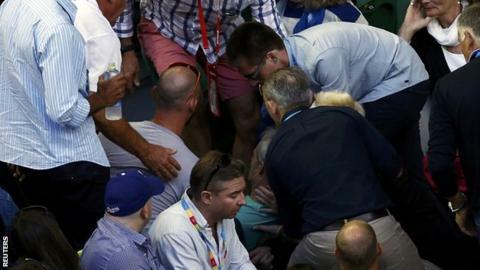 Sears, 58, coaches Ana Ivanovic and was watching her Australian Open match against Madison Keys when he collapsed. Andy Murray visited his father-in-law in hospital immediately after his third-round win on Saturday. Sears' daughter Kim is not in Melbourne as she awaits the birth of their first child in a few weeks' time. "I feel truly grateful to everyone involved for the manner in which this has been handled. While I appreciate the level of media interest in this story I would prefer not to comment any further, thanks." Australian Open tournament director Craig Tiley wished Sears all the best in his recovery. "All of the tennis family is both relieved and pleased to hear that Nigel is being released from hospital. We wish him well and hope to see him back on the court soon." Ivanovic, the 20th seed, was a set up when the incident occurred and went on to lose 4-6 6-4 6-4 to 15th seed Keys. The cause of Sears' collapse has yet to be revealed.